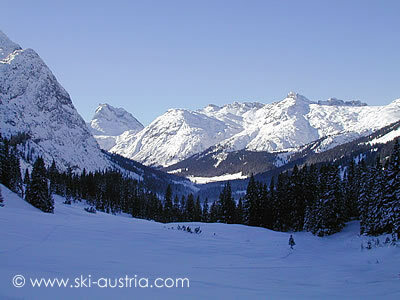 Ski-Austria.com brings you an independent analysis of the top Austrian ski resorts. With resort maps and plans of the ski runs, with lists of the top hotels in the resorts and with a rundown of the best road and rail routes to each ski resort and the most convenient airport. Updated snow reports in the winter. And, above all, fresh ski photos - with the images of the villages in winter and of the ski areas that will tempt any skier to choose Austria as a destination. Lastly, we have visited each resort and have skied the runs so the description is one you can trust. As the end of the winter ski season approaches, a late Easter and a generally substantial snowpack means that skiing is likely to be enjoyable for the final weeks of the Austrian ski resorts. If you are looking to get in one more ski break, then maybe check out our articles about Easter skiing or the best Austrian ski resorts for spring skiing. Of course, Austria probably has the highest number of ski areas which stay open after the normal winter season - we cover them in our summer skiing roundup. With all of the resorts that we cover, village accommodation availability can be checked from the search boxes on the skiing and travel pages. For some of the bigger resorts availability can be checked for individual hotels on the hotels page. In the meantime, we hope you find this site useful in dreaming about your Austrian ski holidays and that you can use it to discover the best Austrian ski area for your winter break. As always, if you have any questions, send us a quick mail. We can't arrange your entire ski holiday for you, but maybe we can point you in the direction of a ski resort which is suitable. The map can be zoomed in and out and moved using the controls on the left to see the ski resorts in more detail. Alternatively, use the navigation to the left to see the ski resorts listed in an order which (roughly!) goes from east to west. Ski-Austria.com is a labour of love written by a former journalist with years of experience in the travel industry and in ski resorts all over the world. A qualified Tyrolean mountain walking guide and ski instructor, plenty of knowledge of the mountains of Austria has gone into these pages covering some of the best ski resorts in the Alps. If you have any questions about our site or if you would like to know more about the different resorts on offer in the country, then please feel free to contact .